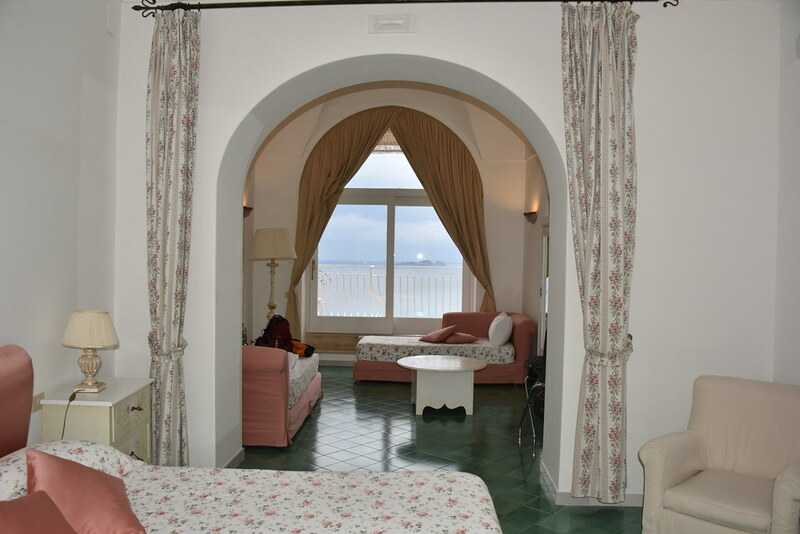 If you’re looking for a lovely boutique hotel in Positano, Villa Rosa is the place to stay. Perched up in the mountains, facing the turquoise waters of the Mediterranean and overlooking the town vistas, its room balconies are ideal to chill after a day of hiking or sightseeing. During our Spring break trip to the Amalfi coast we stayed in Villa Rose in Positano along the Amalfi coast of Italy in early April. At that time of the year, Positano is a quiet little town that was just starting to open for the season. Villa Rosa is located in the middle – between the beach and main street, a short but steep walk from either end of town. Villa Rosa is a small boutique hotel with under 20 rooms. The main attraction of our Sea View Suite was the spectacular view of the sea and the town. The suite was very spacious with a living room, a large bedroom and a spacious balcony to relax and soak in the views. The room decor was very tasteful and was in complete harmony with the Mediterranean vibe. Service was great with a very courteous staff. They helped us with all our questions and planning our daily activities. The staff brought our delicious breakfasts into the room which we asked them to serve on the balcony, overlooking the water and the steep hills of the Positano. It was so beautiful that it’s forever etched in my memory – the crystal blue waters with boats coming from nearby towns and the iconic view of the hills. Looking over from the balcony of our room in Villa Rosa. Many rooms have a partial view or obstructed. Be sure to book a full sea view room. The additional cost is totally worth it. Roads in this part of Italy are extremely narrow with sharp curves, and they hang off the cliffs in many sections. I would suggest taking a taxi or the convenient public buses and boats. Capri is a short boat ride from Positano and has some of the most beautiful beaches in the world.